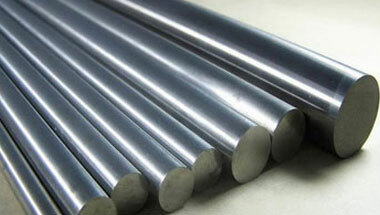 Manufacturer & Exporter of Stainless Steel 317L Round Bars & UNS S31703 Round Rods, SS 317L Bright Bars, Steel 317L Rods, 317L Hexagonal Bar Suppliers in India. We are an authentic manufacturer & exporter of Stainless Steel 317L Round Bar, which is manufactured using the supreme grade raw material and is offered in varied forms in accordance with the requirement of our clients. This range is available in different dimensions as needed by the patrons. These products are widely applicable in different fronts such as pharmaceutical companies, pulp and paper mills, pharmaceutical companies and fertilizer. Stainless Steel 317L are molybdenum bearing austenitic chromium nickel steel like Stainless Steel 316, aside from the compound substance in 317L is to a degree higher. It has a superior erosion resistance in exceptional applications where it is coveted to diminish defilement to a base. Stainless Steel 317L were produced principally to oppose all the more viably the assault of sulfurous corrosive mixes. They are tested on different sorts of quality parameters and are used in diverse industries such as food industries, chemical industries , electrical industries, generator industries, shaft industries, cement industries, gas industries, power project. We always charge industry leading rates and adhere to varied customers’ demands. Stainless Steel 317L Round Rods Manufacturer, SS 317L Forged Bar, Steel 317L Hex Bar, Stainless 317L Hollow Bar, WNR 1.4438 Black Bars Supplier in India. Uganda, Brazil, Kazakhstan, Turkey, Angola, Tunisia, South Africa, Peru, Jordan, Trinidad and Tobago, Ghana, London, Cameroon, Australia, Morocco, Chine, Indonesia, Azerbaijan, Saudi Arabia, Sri Lanka, Iran, Mexico, Italy, Israel, Sudan, Dubai, Iraq, Mozambique, Kuwait, Malaysia, Canada, Vietnam, Colombia, Bahrain, Venezuela, New Zealand, Germany, Nigeria, Africa, United States, UK, Houston, Russia, Egypt, Ethiopa, Democratic Republic of the Congo, Thailand (Bangkok), UAE, Algeria, Argentina. Muscat, Addis Ababa, Bethlehem, Subra al-Haymah, Bamako, Amman, Giza, Maiduguri, Tehran, Singapore, Casablanca, New York, Kampala, Mecca, Sharm el-Sheikh, Manama, Freetown, Kaduna, Istanbul, Kano, Tripoli, Douala, Doha, Maputo, Luanda, Antananarivo, Jerusalem, Lusaka, Abu Dhabi, Fez, Cairo, Hong Kong, Lagos, Ouagadougou, Cairo, Kolwezi, Algiers, Yaoundé, Mbuji-Mayi, Alexandria, Durban, Dar es Salaam, Riyadh, Soweto, Kinshasa, Rabat, Aqaba, Lubumbashi, Abidjan, Omdurman, Conakry, Benin, Colombo, Cape Town, Dakar, Ibadan, Dammam, Accra, Bulawayo, Dubai, Khartoum, Zaria, Port Elizabeth, Mogadishu, Tel Aviv, Nairobi, Brazzaville, Pretoria, Port Harcourt, Byblos, Beirut, Data from the UN, Harare, Jeddah, Johannesburg.